October 15, 2014 -- Michael Roberts Blog, posted at Links International Journal of Socialist Renewal -- This time last year, I outlined the results of the Global Wealth report published by Credit Suisse Bank (see http://thenextrecession.wordpress.com/2013/10/10/global-wealth-inequality-10-own-86-1-own-41-half-own-just-1/). Compiled by Tony Shorrocks and Jim Davies, formerly at the UN, that report showed that the top 1% owned 41% of all the personal wealth in the world; the top 10% owned 86% and the bottom 50% of owned less than 1% of all the wealth. This staggering level of inequality certainly attracted interest and my post on this was the most popularly viewed one on my blog ever. Now Credit Suisse have published its 2014 report compiled by the same academics. According to the latest calculations, global wealth inequality has got even worse. Taken together, the bottom half of the global population still own less than 1% of total wealth. And the richest 10% still own more or less the same, now 87%. But the top 1% now own 48% of all global personal wealth! If you like a soundbite: the top 1% of adults in the world own nearly half of all personal wealth. There seems to be no stopping the growing inequality of wealth in the world. 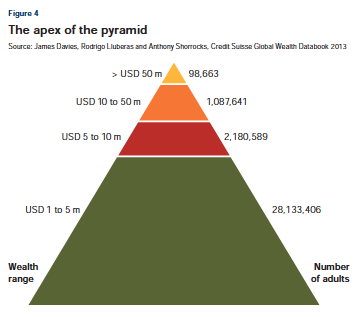 The latest analysis comprises the wealth holdings of 4.7 billion adults across more than 200 countries – from billionaires in the top echelon to the middle and bottom sections of the wealth pyramid, which other studies often overlook. It really is the most comprehensive and revealing account of global personal wealth. The funny thing is that it does not take all that much wealth to get into the top 1% or top 10%, Once debts have been subtracted, a person needs only $3650 to be among the wealthiest half of the world’s citizens. However, about $77,000 is required to be a member of the top 10% of global wealth holders and $798,000 to belong to the top 1%. So if you own a home in London (average value now $750,000) on your own and without a mortgage, you are part of the top 1% and many people can claim to have $77,000 worth of property after the mortgage in the US and Europe. Do you feel rich if you do? This just shows how poor the vast majority of people in the world are: with no property, no cash and certainly no stocks and bonds! Global household wealth has now reached $263 trillion, or about four times the annual product of the world’s working population. The average wealth per adult is now $56,000, a jump of $3450, or the biggest annual increase since the global financial crisis. Global wealth now stands 20% above its pre-crisis peak and 39% above its 2008 low. On a regional basis, North America and Europe led the gains with increases of about 11%. In contrast, aggregate wealth in Latin America was largely unchanged, whereas Asia-Pacific (including China and India) recorded a small rise of around 3%. Excluding Japan, the region recorded a gain of about 4%, with Chinese wealth rising by 3.5% and Indian wealth falling 1%. The number of dollar millionaires has increased significantly since 2000, rising by 164% over the period, to 34.8 million. The US has 41% of all global millionaires. According to the report, the number of global millionaires could exceed 53 million in 2019, a rise of more than 18 million. China could see its number nearly doubling by 2019, to 2.3 million adults. Brazil and Mexico will underpin the number of millionaires in Latin America, which could reach 921,000 in five years. What is also valuable in this year’s report is a measure of median wealth (the 50% point in wealth distribution) as well as mean average wealth. Global median wealth has been falling every year since 2010, while mean wealth has been rising. The poor are getting poorer and rich are getting richer. And the top 1% are getting further away from the top 10%. The report also shows that wealth inequality is much higher than income inequality and this is a worldwide phenomenon. This is important because there is always much talk about income inequality and this being due to people having better education and skills etc. But it is wealth that really matters and that is down more to inheritance and luck rather than skill, something the report discusses. That brings me to a brand new study by Emmanuel Saez and Gabriel Zucman, close colleagues of Piketty, on the wealth inequality in the US since 1913 (SaezZucman2014Slides). The study combines income tax returns with flow of funds data to estimate the distribution of household wealth. Again they confirm the Credit Suisse study and Pilketty’s work (which uses the same data) that wealth concentration has followed a U-shaped evolution over the last 100 years: it was high in the beginning of the 20th century, fell from 1929 to 1978, and has continuously increased since then. Saez and Zucman make the point that the rise of wealth inequality is almost entirely due to the rise of the top 0.1% wealth (the uber-rich) share, from 7% in 1979 to 22% in 2012, a level almost as high as in 1929. 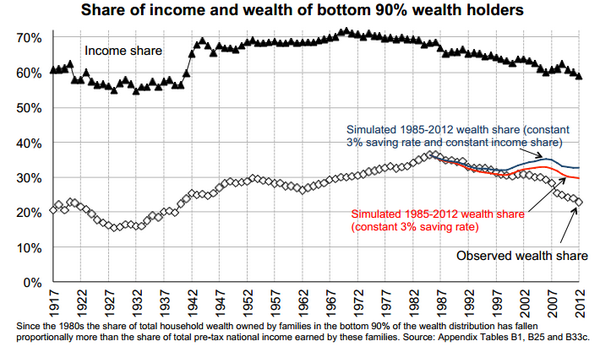 The bottom 90% wealth share increased up to the mid-1980s and then steadily declined (see graph below). And the main reason that happened is that the 90% are now not earning enough to save anything at all, especially to buy property and so build up wealth. The poor (that’s 90% of us) are getting poorer and the super-rich (0.1%) who rule the world are getting very much richer.